15 - 20 mm in length, they have bright yellow and black bands along the body, with an obvious 'waist' between the thorax and abdomen. They also have two pairs of wings and fairly long, robust antennae. The sting is located at the tip of the abdomen. The queens (reproductive females) are larger than workers (non-reproductive females). 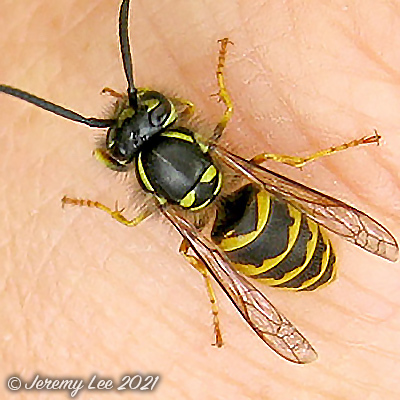 Vespula vulgaris can be distinguished from other similar social wasps by the anchor-shaped mark on its face. It is found in a wide range of habitats and is common in gardens, woodlands and meadows as well as around habitation. The common wasp usually forms large colonies below ground, but occasionally nests may be made in wall cavities, hollow trees and attics. Queens emerge from hibernation during the spring, and they search for a suitable location in which to start a new colony. She then begins to build the nest with chewed up wood pulp, which dries to make a papery substance. A few eggs are laid, which develop into non-reproductive workers. These workers eventually take over the care of the nest, and the queen's life is then devoted solely to egg laying. At the end of autumn a number of eggs develop into new queens and males, which leave the nest and mate. The new queens seek out suitable places in which to hibernate, and the males and the old colony (including the old queen) die. Widespread and common throughout Britain, especially in the south.